Template Component is SSIS Data Flow Component providing ability to setup data flow output text columns, based on other input columns and package variables and a template. The template definition is based on Apache Velocity engine. Grid to define result columns. Variables and column reference tree. Select result column type. This property has the options listed in the following table. <add as new column> A new output column is setup for result. 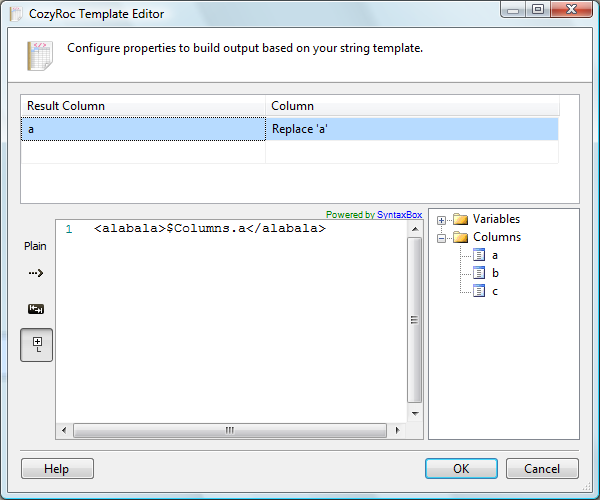 Replace '...' Selected existing input column is replaced with the template result. Build a template that uses a variable or an input column by dragging the variable or column from the list of available variables and columns to the template edit window. Specify result column template. The value of this property can be specified by using a property expression. Where can I find the documentation for the Template? New: Support for #evaluate directive.